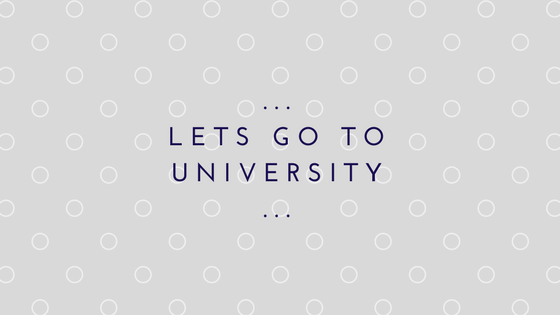 I believe most people that read my blogs have already been to university or have chosen not to, however, this is for anyone that hasn’t been to university, anyone whose interested in my journey and myself – so I can look back when motivation runs low. So, let’s go back to 2014. I had completed college and couldn’t choose between doing a degree in geography or drama, and in August that decision was made up for me when I didn’t get the grades I needed. Let me just say, that I was actually so relieved because I had NO CLUE what I wanted to do and was just applying because that was what was ‘expected of me’ (hint; that was a BAD MOVE). I went back to college in the September and was completely over it after about 3 weeks… so then I went back AGAIN in October to February, even then, I couldn’t decide what to do. I then worked full time until I got a place on a programme at my church that lasted for 10 months in September 2015, during that time I got the chance to work with children and families, not only that but got the experience of working with people from different backgrounds, going completely different paths and briefly we all got to converge on the same path for a brief amount of time. It was there that I realised my passion for working with, supporting and helping others, especially children, young people and families. I started looking around at what I could do and landed myself on an access course, which I think really helped me get back into education after a few years out of it. From there, I had a good look around and after battling between criminology, youth justice, even creative expressive arts, I felt the best fit for me would be going into social work. So here I am, 21 years old, about to start my flipping DEGREE next week (NEXT WEEK – WHAT?!) I genuinely thought I would never get to this point, like ever. But I guess it goes to show that if you’re meant to do something the right doors will open for you to do it – at least that’s what I believe. I am SO excited to finally study a subject that I genuinely want to do, however I am a little bit nervous because I’m living at home and not in halls, which means connecting with people is going to be a bit harder and I’m actually going to have to be intentional with it. However, there’s a couple of societies I have my eye on that I hope if I get involved with, I can start making friends that way, but if anyone has any tips… feel free to leave me them! I don’t really know what to expect of the workload or the type of work yet. I think I have a good footing because we covered a lot of the ‘basics’ we learn in the first year in my access course but we’ll see how that goes. Previous What Even is Success?